Emmet is our 10-year-old black lab that we’ve had since he was a puppy. Unfortunately, he is now beginning his fight with malignant melanoma. That’s right. Malignant melanoma. The type of skin cancer that every human dreads because it is so hard to treat. It turns out that dogs can get it too and it is just as bad for dogs, as it is for humans. With Emmet, it started out with us noticing that he had lost part of his toenail on his left rear foot. 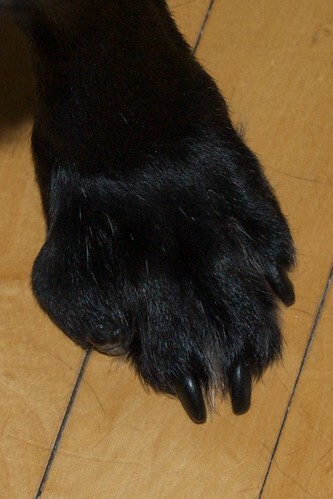 Normally, losing a nail is really painful for a dog and normally it bleeds like crazy, as they have blood vessels in their nails. Emmet has always been a stoic dog, and so it didn’t surprise us that much that it didn’t seem to slow him down, but because of that, we didn’t notice it until it was already infected. We took him to the vet and started a course of antibiotics. A few weeks later his nail began to grow back, but it was a just a sliver of a nail and it was clear that it bothered him a bit, so we kept it trimmed really short. infected again. We brought him back to the vet and as she looked at it, she grew concerned. It looked different than before. We decided to do a biopsy and it was quite clear as she did the biopsy that his toe wasn’t swollen with infection. It contained a mass of some kind — a tumor. She took a sample and we sent it off to the pathologist. She also noticed that his lymph node near his knee on the same leg was swollen too. A week later, the biopsy results came back. It wasn’t good news. It was malignant melanoma — one of the worst kinds of cancer. It tends to be very aggressive, fast growing, and worst of all — it can rapidly spread to other parts of the body, especially the lungs. Given the type of cancer, Emmet’s prognosis was not great. He might live a few weeks, a few months, or perhaps another year or two. it all depended on whether or not the cancer had spread. The question now was, “What can we do to treat him?” I’ve always been against doing radical treatments on dogs. You can do chemotherapy. You can do radiation treatments. The problem is that these treatments cause the dog to get really sick and/or cause even more pain. Although they can prolong their life, it isn’t often by very much — a few months at best and much of that is not quality time. So we started debating how to best treat Emmet. Our goal was to make sure that the time he had left, however long that was, was quality time. We talked with our vet. With talked with our parents. We talked with our trusted friends. We came up with a plan. We decided to have Emmet’s lungs X-rayed. If the cancer had spread, it was likely going to end up in his lungs. If it was already in his lungs, further treatment was futile. He would die within a matter of a few weeks. Fortunately for us, the x-rays were clean. No cancer in his lungs….yet. Now that we knew that, we could decide where to go. The toe involved was a non-weight bearing toe and tumor seemed to be limited to that toe, and perhaps one lymph node in his leg. Other than the tumor, Emmet was happy and healthy. His heart and lungs were strong. He was a good risk for surgery. We opted to have his cancerous toe removed and the questionable lymph node removed as well. That surgery happened earlier this week. The goal was to get rid of the obvious cancer so it wouldn’t spread and to get rid of a sore spot on his foot so he could walk, run, and play. So far so good. The surgery went as planned and Emmet is healing nicely. Once it is healed, he’ll never miss that toe. How will this end? We don’t really know the details, but I’m sure the cancer will eventually kill him. It is, without a doubt, lurking somewhere else in his body. But, given that we have gotten rid of the obvious tumor and questionable lymph node, I’m hopeful that we’ll see his wagging tail around our house for a while yet. I’m hoping for at least a year, but I’ll be happy with whatever God gives us with our sweet, loveable, dog. I’m not going on holiday until Tuesday so I will have u til then to nurse him and keep and eye on him myself. Our 8 year old Spaniel Misty just had a suspicious lump and toe removed from her front right paw. The tests came back today positive for this aggressive cancer, so she is back to the vets tomorrow for samples to be taken of her lymph nodes and chest x-rays. We re-homed her only 12 months ago, so I’m just hoping that we can catch this thing and get her back healthy. Only time will tell I guess. I’m sorry to hear about Shadow. I wish you and Shadow the best!